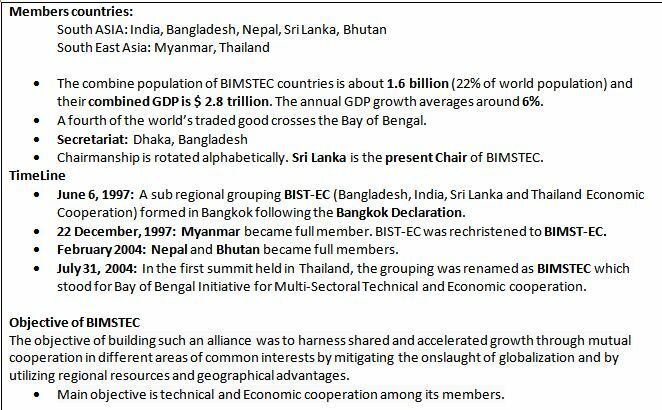 4th BIMSTEC Summit was held on 30and 31 August in Kathmandu, Nepal. It is an international organization of seven nations of south Asia and south East Asia lying in the littorals and adjacent areas of Bay of Bengal. BIMSTEC not only connects South and Southeast Asia, but also the ecologies of the Great Himalayas and the Bay of Bengal. Bangladesh: A platform to project itself as an important power of Bay of Bengal. India: A platform to bypass Pakistan and China and showcase its ‘Neighborhood first’ and ‘Act East policy’. Myanmar & Thailand: A platform to access the consumer market and improve relation with India. Sri Lanka: Gateway to South East Asia. Charter: Decision to strengthen BIMSTEC’s institutional foundation by starting negotiation on long overdue charter. Policy reform to strengthen the BIMSTEC secretariat. Also a permanent working committee will be set up. Combating terrorism finds mention in the joint declaration. Signed by all member countries to stimulate trade and investment. Trade Negotiation Committee (TNC) was set up to negotiate in areas of trade in goods and services etc. Renewed the group’s commitment to an early Free Trade Agreement (FTA). BIMSTEC Development Fund has been formed to prevent financial constraints. Underscored the necessity of making concrete efforts to ensure the conservation of mountain ecosystems. Decided to establish an Inter-governmental Expert Group to develop an action plan on blue economy. Political recognition of Bay of Bengal as a sub region in its own right at the head of emerging Indo pacific construct. PM Modi while speaking at the summit termed connectivity as the biggest opportunity at BIMSTEC. He called for Trade connectivity, transport connectivity and people to people connectivity among BIMSTEC countries. Kathmandu declaration reiterates the BIMSTEC member states resolve to conclude the BIMSTEC Coastal agreement and BIMSTEC motor vehicle agreement. Kaladan Multi-modal transit transport project, which will connect Kolkata to Mizoram via Myanmar, has been hailed as “Future gateway to South East Asia”. Ongoing work on 1,400km long India-Myanmar-Thailand Trilateral Highway which will connect Moreh, India with Mae sot, Thailand via Myanmar. Coastal shipping agreement to facilitate coastal shipping within 20 nautical miles of the coast line in regions to boost trade. A MoU was signed to establish BIMSTEC grid interconnections to enhance energy cooperation among member states. Early start of BIMSTEC Energy Centre in Bangalore. ‘Bodhi Parv’, a 3 day festival themed on Buddhist heritage was held in 2017 December to celebrate 20th anniversary of BIMSTEC. Kathmandu declaration calls for the establishment of a Buddhist circuit in the region. India is organizing an International Buddhist conclave in 2020. PM Modi has invited BIMSTEC members for the conclave. India can play a leadership role in the region through BIMSTEC. BIMSTEC could allow India to push a constructive agenda to counter China. India can follow best practices for connectivity projects based on recognized international norms. The Chinese projects are widely seen as violating these norms. Bay of Bengal can be showcased as ‘open and peaceful ‘in contrast with China’s behavior in South China Sea. It is seen as having potential to emerge as a building block of economically vibrant Indo-Pacific region. BIMSTEC can help India to work more closely with other Indo pacific groupings like ASEAN in the region. Work on trilateral India Myanmar Thailand Highway which would eventually extend to Cambodia, Laos and Vietnam is still patchy. The 2015 Indian Proposal for trilateral motor vehicle agreement to facilitate seamless movement of passengers and cargo among the three countries is pending. India is concerned that the FTA in the current form might lead to its domestic merchandise Industry not able to compete with its Bangladeshi counterparts. 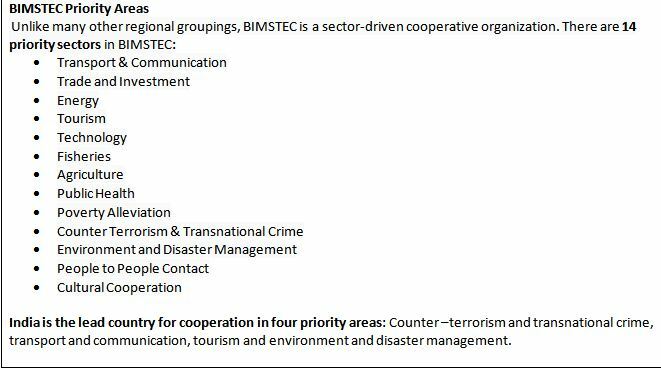 Critics have argued that there are many priority sectors in BIMSTEC and this should be narrowed down for BIMSTEC to be effective. Lack of adequate financial and manpower resources constraining the performance of the body. India is the largest contributor and contributes annually about 32% of the budget. It is necessary to counter the impression that BIMSTEC is an India dominated bloc like the SAARC. SAARC has failed in its objective that seeks to contribute to the mutual trust and understanding among members. SAARC’s performance has been less than satisfactory and its role in strengthening the regional cooperation is questionable. Recent Obstructions in SAARC: The SAARC motor vehicle agreement couldn’t take place due to Pakistan’s objection. Similarly SAARC satellite was objected by Pak. This has led to SAARC becoming a non-functional grouping. Unresolved border issues and mutual suspicion has also heightened the lack of cooperation between countries. PM Modi has earlier announced that regional integration in South Asia would go ahead through SAARC or outside it. With this vision India has tried to actively pursue greater role in BIMSTEC. SAARC countries have a shared history and have close socio cultural & linguistic linkages. SAARC and BIMSTEC complement each other in terms of functional goals. The success of BIMSTEC does not render SAARC pointless; it only adds a new chapter in regional cooperation in South Asia. 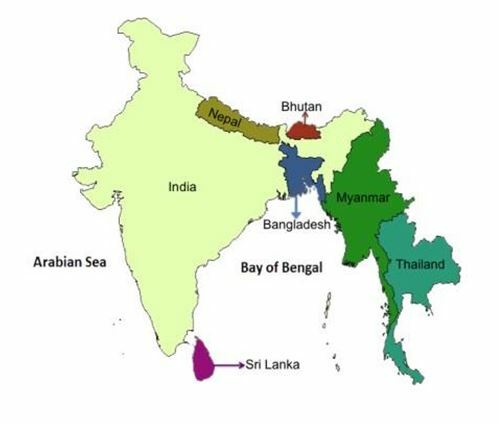 Budget constraints which constrained SAARC could occur in BIMSTEC. As China expands its BRI project in BIMSTEC countries, BIMSTEC could be a new battleground for Indo-China Battle for dominance. Problems have already begun to appear as Nepal and Thailand have declined to participate in the BIMSTEC military exercise MILEX-18 owing to Chinese pressure. Connectivity projects should be given a priority. India must take a lead role because BIMSTEC stands at the centre of its ‘Neighborhood first’ and ‘Act East’ Policy, its major foreign policy priorities. The region has potential to become a hub of economic activities. To leverage the opportunities in the region, a strong regional cooperation mechanism is necessary. Nepal PM while speaking at the 4th summit stressed on the importance of translating BIMSTEC to a performance oriented organization. If his prescription is followed in true spirit then BIMSTEC can become a dynamic, effective and result oriented organization.